Do you, or one of your friends or family deserve a lazy day off after shopping and running all around town? 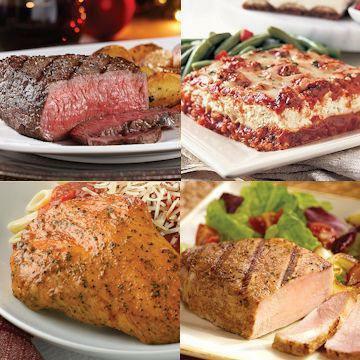 Let us do all of the work by taking all of the hassle out of meal planning. Our Send a Meal Deal buffet is perfect for feeding up to 16 at one time, or these meals are perfect dinners for four to be enjoyed over the course of a few days. You're in full control. Do Not Thaw! Microwave: Place covered lasagna tray in microwave. Microwave on high for 8-10 minutes or until internal temperature reaches 165�F. Remove from microwave. Let stand for 5 minutes before carefully removing film. Slice and serve. Oven: Preheat oven to 350�F. Carefully remove film from tray before baking. Place frozen tray of lasagna on a baking sheet in the center of the oven. Bake for 60-65 minutes or until internal temperature reaches 165�F. Let stand for 5 minutes. Slice and serve. Bake: Preheat oven to 350� F. Remove potato from package. Place desired number of frozen portions on an ungreased baking sheet. Bake 40 minutes, until heated through and lightly browned. Grill: Preheat grill. Remove potato from cellophane package. Place frozen potatoes on a sheet of aluminum foil. Wrapping foil around potatoes, leaving top half exposed. Grill on medium-high heat. Cook with grill lid down for 35 to 45 minutes. Microwave: Remove potato from wrap. Place one frozen potato on microwave safe dish. Cook on high for 21/2 to 4 minutes rotating at half way point. To cook two potatoes, increase cooking time to 4 to 6 minutes. Ingredients: Spinach Lasagna Noodle (Enriched Flour (Durum Wheat, Niacin, Ferrous Sulfate, Thiamine Mononitrate, Riboflavin, Folic Acid), Water, Eggs, Spinach Powder), Fire Roasted Vegetables (Artichoke Hearts, Onions, Green Zucchini, Yellow Zucchini, Red Peppers, Tomato, Garlic (Garlic, Canola Oil, Olive Oil, Natural Flavor)), Tomatoes (Tomato Sauce (Fresh Vine-Ripened California Tomatoes, Salt, Red Pepper, Dehydrated Onion, Dehydrated Garlic, Spice Extractive, Citric Acid), Tomatoes, Calcium Chloride, Citric Acid), Mozzarella Cheese (Pasteurized Part-Skim Milk, Cheese Cultures, Salt, Enzymes), Ricotta Cheese (Pasteurized Whey, Pasteurized Milk, Cream, Vinegar), Heavy Whipping Cream (Grade A Cream, Guar Gum, Carrageenan, Locust Bean Gum), Water, Whole Egg, Mushrooms, Onions, Romano Cheese (Pasteurized Cow's Milk, Cheese Cultures, Salt, Enzymes), Garlic, Spices, Parmesan Cheese (Pasteurized Part Skim Milk, Cheese Cultures, Salt, Enzymes), Capers (Capers, Water, Vinegar, Salt), Extra Virgin Olive Oil, Sugar, Salt, Modified Food Starch, Wheat Flour, Butter (Cream, Salt), Flavorings, Parsley. Contains: Milk, Eggs, Wheat. Ingredients: Beef, Bacon Cured with: Water, Salt, Sugar, Sodium Phosphate, Sodium Erythorbate, Sodium Nitrite. These products are processed in our plants in Nebraska, USA after undergoing a strict series of quality checks and under the supervision of the United States Department of Agriculture.